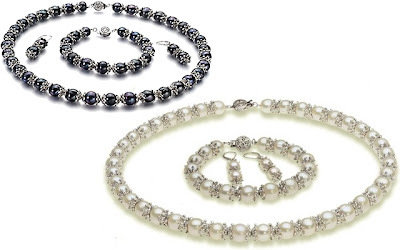 This PearlsOnly MarieAnt Black 8.0-8.5mm AA Freshwater Cultured Pearl Set is currently selling for just $59.25 on Amazon.com! You will be saving 85% off the listed price of $395.00 with this jewelry deal. This set comes with an 18" necklace, a 7.5" bracelet, and sterling silver lever back earrings and is also available in White Freshwater Cultured Pearls.